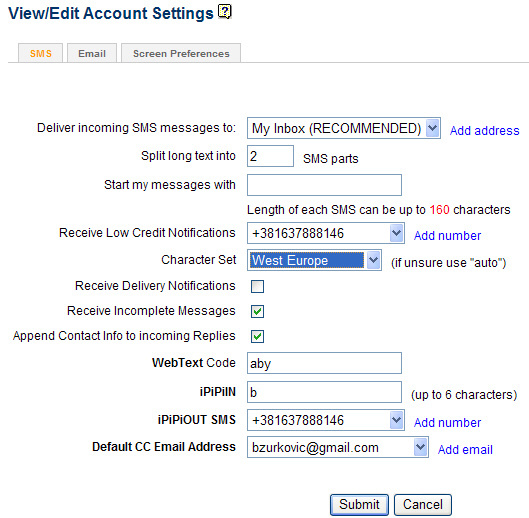 Go to your SMS Settings page to define your WebText Code. Your WebText Code should be 6 to 12 characters long and is case insensitive. Because Confirm Code acts like a password, it's highly recommended to change it frequently. Now go to your email account and compose your message. Address your message. If you want to send SMS to '+18887776666', simply put '+18887776666@opensms.ipipi.com' in the To field. Enter your WebText Code in Subject field and send! There is another benefit to defining WebText code in your account. If you forward incoming SMS messages to an email account, our service will format such email messages so that you can simply hit the reply button in your email reader, write your message and send. Your email message will be received by our service which will convert it to SMS and send it to the original sender. Cool, eh? !